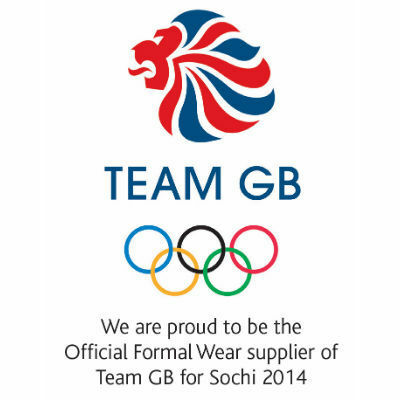 Oliver Brown is pleased to announce that we will be the Official Supplier of Formalwear to Team GB's delegation participating in the Sochi 2014 Olympic Winter Games. Oliver Brown will provide more than 1100 items of formalwear to Team GB, including 176 bespoke jackets featuring Team GB embroidery on the outside pocket, a Union Flag on the inner pocket and Team GB neck hanger. Kristian Robson, Owner and Creative Director of Oliver Brown, and a team of fitters were present at the recent Team GB Sochi 2014 Conference to fit athletes and team officials for their Olympic formalwear. Oliver Brown will also be part of the Team GB Kitting Out programme for the Sochi Games as every athlete and official receives their full collection of Team GB apparel. Designed and sourced in the United Kingdom, the best of British winter-sport athletes will showcase the best in British craftsmanship at occasions such as the official Team GB reception in Sochi. Oliver Brown’s formalwear offer for Team GB will see men and women provided with a bespoke suit made with 100% British wool, a pure cotton shirt and a custom Team GB suit bag. Male members will also have a bespoke silk tie as well as cufflinks and socks, with the women receiving a bespoke scarf crafted using a mix of fine cotton and pure silk. Oliver Brown is using only 100% pure fabrics to deliver designs of unsurpassed fit, quality and comfort for Team GB. Known for their quality, cut and timeless style, Oliver Brown’s shop in Lower Sloane Street, London, has provided bespoke, tailored and off the peg attire for every occasion over the past 30 years. Oliver Brown has a history in dressing for sporting occasions and is in fact the only trader invited to sell top hats inside the Royal Enclosure at Royal Ascot. “As a British label Oliver Brown’s ethos is underpinned by traditional values, with British heritage at the very core of our brand. Following the outstanding success of Team GB in the London 2012 Olympic Games, I am absolutely thrilled to be supporting the team at the games in Sochi and very excited to announce our partnership with such an exceptional organisation.